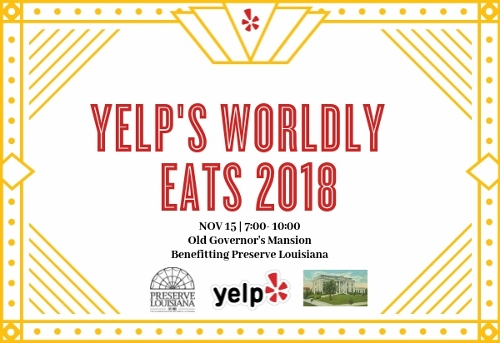 Join Yelp, Inc. - Baton Rouge for an unforgettable evening filled with ethnic eats, sips & entertainment represented by local restaurants and businesses on Thursday, November 15 from 7:00-10:00 PM. The festivities ignite on Thursday, November 15 from 7:00-10:00pm to celebrate the 3rd Annual Yelp's Worldly Eats event with ethnic eats, sips and entertainment. 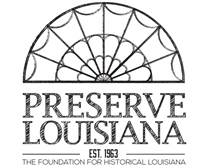 100% of the funds raised from the event will benefit the Preserve Louisiana organization. This year's focus will be on the history and rise of ethnic cuisine in the capital city. The suggested donation is $20 per person (through Preserve Louisiana's website) or $25 per person at the door. Age 21 and up. We hope to see you at this fun-filled community to take place at the historic Old Governor's Mansion.